Did you know there is a FB page for Smarties, Nerds, and Dum Dums? Well, there is. 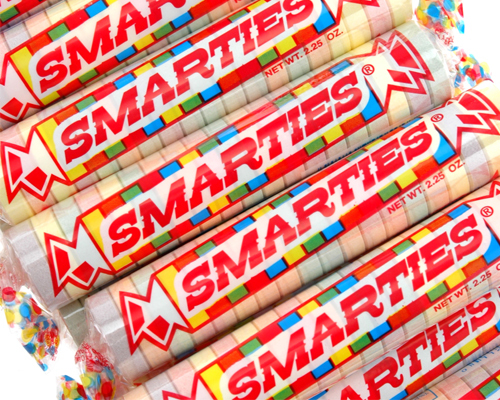 Did you know that some teachers give out Smarties for correct answers, and Dum Dums for incorrect ones? Well, they do. First of all, my child psychology professor would send me a reprimand email (as he has done in the past) if he knew I was even considering giving candy for rewards. Those are extrinsic rewards that promote behaviorism. (Think Pavlov’s dogs.) But how can a Twizzler possibly hurt anyone? We want children to learn for intrinsic reasons. But this is not the point I’m trying to make. The issue for me is that we are telling children they are Dum Dums if they get an answer wrong. I understand that not every teacher gives out name-calling candy. Although, a “Nice Try” or “Did You Study?” candy would be great for high-schoolers. I’m referring to testing. Yes, it is that time of year again, and I’m on one of my rants. In one of my graduate classes, we learned that high test scores don’t necessarily correlate to future academic or work-force success. Did you ever make A’s in a class because you memorized the information the night before? We all did. The only reason I know anything about the Civil War is because I taught it for three years as a fifth grade teacher. I definitely don’t remember one battle from my college Civil War experience. One advantage of NCLB is that it has provided us with a decade of data that validates the fact that American students are below average in reading and math. I like data. So, they get a check for that. Ten states have accepted the NCLB waiver. This is as long as we implement a college and career-ready curriculum. Education Secretary Arne Duncan said that current law drives down standards, weakens accountability, causes narrowing of the curriculum and labels too many schools as failing. Moreover, the law mandates unworkable remedies at the federal level instead of allowing local educators to make spending decisions. It took ten years to figure this out. DUH. Is there a life-size Dum Dum we can give to NCLB? It would clench a Dum Dum in one hand, and weep into a box of waivers. Following its sloth-like gait, there are hundreds of thousands of students yelling, “Wait! You left me behind!” NCLB randomly tosses waivers in the air, without looking back, as he shuffles away. Dramatic much? Yup. But, we experimented on a generation of students, and there is nothing we can do about it. Maybe, we can think ahead and put kids first? We should all aspire to be Smarties on this goal. My opening thought is about PINTEREST. I didn’t want to be on Pinterest until the Pinterest people put me on a waiting list. Then I HAD to be accepted. So, I asked my friend to invite me. 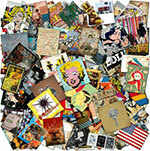 I soon realized that it was the same as cutting out pictures of magazines and taping them to my walls in the 80’s. I had the perfect house and John Taylor (from Duran Duran) was smiling from our sunroom. I had collages of my favorite clothes and shoes. I even wrote poetry to accompany my re-assembled life created from magazine pictures. Now, within a matter of seconds, my collage life can be validated with re-pins and likes. In my Advanced Curriculum and Instruction class, we are studying research-based instructional practices. One of my favorite activities is making analogies out of math terms. For example circumference is to perimeter as __________ is to__________. Pinterest is to Drama Club as creating imagery is to imagining creativity. See? I’m still in my existential mode. I haven’t blogged about drama club lately. Partially, because the year has escaped me. But mostly, because when I think of what needs to be done by May, I shudder in fear. We are performing Sleeping Beauty, the musical, James and the Giant Peach, and a kids version of Macbeth. I am directing James and Macbeth. One thing we did better this year is to have each play rehearsal on a different day of the week. This way, we can use the pretend stage for blocking. It is hilarious what happens when small people step on stage. They suddenly become animated, their voices change, and the see an imaginary audience sitting in government-issued blue school chairs. I have blogged before about why teachers continue to show up at work. Today, as I was watching my James and the Giant Peach cast rehearse, I felt incredibly thankful. First of all, Aunt Sponge and Aunt Spiker make me laugh. I don’t mean giggle. They are hysterical and one hundred percent invested. We were in the gym today because the fake stage is prepared for a chorus concert. So, the cast and I were sitting on the floor, leaning against the walls. The girl next to me, put her head on my should for a moment while she read over her script. I looked at the rest of the cast, and they were reading along as the actors were performing. It was just one of those moments that brands itself somewhere in the spirit. Many children rehearsed without scripts today. If you don’t know this play, it is verbose and lengthy. So, the thought of being of book by the fourth rehearsal is unheard of. But, a couple of the cast were memorized. Unbelievable. These kids are in fourth and fifth grade. The earthworm will be wearing a crash helmet and clutching a first aid kit. The spider randomly tap-dances. Silk worm is a bit of a narcaleptic and wears a snuggie and a sleeping eye mask. The little old man who brings the magic is played by a remarkable boy. When he rehearsed today, we were silent and amazed. When he finished, the cast clapped. Now, a giant peach needs to be constructed. The top of it. The outside of it. The inside of it. Maybe, I’ll have a flash of lucid brilliance in the middle of the night. Macbeth. This cast is equally entertaining. I told ten-year old Lady Macbeth to act as if she is ‘losing it’ when she hears owls and crickets. I soon realized that ten-year olds don’t have background knowledge of ‘crazy’. And it would be inappropriate for me to feign ‘crazy’, since it might be too realistic. The kids are convinced that when King Duncan is ‘taken out’ that we need to use ketchup for blood. I will be using red cloth for a stylized elementary school version of his demise. But, they are obsessed with the ketchup. We cannot have swords in the school-even ones for the play. So, Macbeth will kill Duncan with a toilet bowl plunger. Ghost Banquo is going to be a puppet. It just has to happen. The witches don’t cackle, but I’m extracting maniacal moments, so I’m good. This year has been very difficult, for many reasons. Being around children who are excited about everything, can only make a bad day (or year) vaporize. Here’s to amazing children and playing virtual dress-up.